The external threat landscape is evolving; web-based malware and legitimate website hacking is continuing to fluctuate as we learn and adapt our network defence strategies, or externalise our infrastructure to mitigate risk. However, do these initiatives around protection extend to our customers? Every organisation has a web presence and increasingly this presence is not just for broadcasting corporate brands and products; it is used to collect and socialise personal information from customers and constituents and process regulated financial transactions. 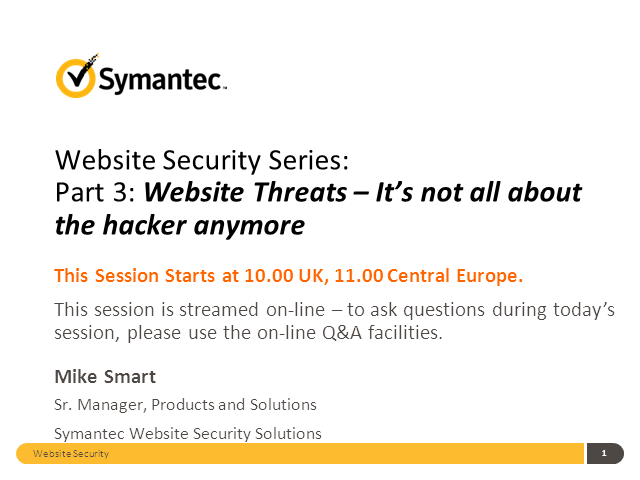 Mike Smart is the Senior Manager of International Product and Solutions at Symantec. In his role, Mike is responsible for driving Symantec’s Trust Services business across International and emerging markets. He joined Symantec in 2012 from SafeNet where he was Director of Products and Solutions in EMEA. Mike has a strong history in the SMB and Enterprise IT Security arena and has been at the forefront of introducing new technologies and solutions to the market in areas such as Cloud Security Solutions, Information Leakage Detection and Prevention and Unified Threat Management. Mike is an active member of the UK’s Get Safe Online not-for-profit organisation which provides a leading source of unbiased, authoritative information on protection against fraud, identity theft, viruses and many other problems encountered online.